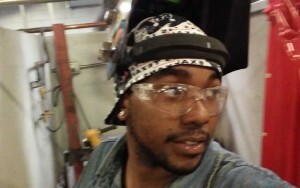 Trent Williams, aged 25, from Houston, TX, graduated from Tulsa Welding School & Technology Center – Houston campus (TWSTC) in August 2015. 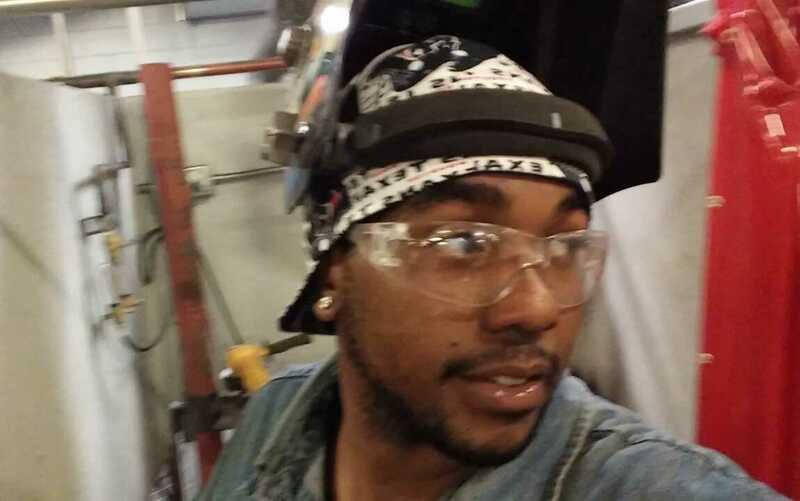 Trent was in the second class to graduate from the Houston Welding Specialist program. 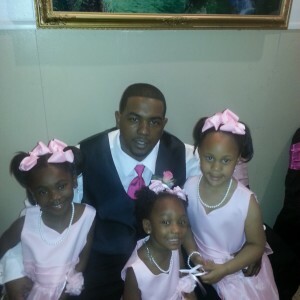 Thanks for sharing your story Trent; what work did you do before you came to TWSTC? I was basically jumping around. I did security, lifeguarding, warehouse work. I did everything, a bunch of different jobs but none that could become a career. To be honest with you I used to work with a girl who told me her husband made good money welding. How did you find yourself at TWSTC? I tried to go to community college for welding two years ago, but there was a whole bunch of hoops to go through first. They told me I had to take six weeks of basic classes first, but I was like “I just want to weld!” Later I saw a Tulsa Welding School commercial saying they were opening a Houston campus. What did you enjoy most about Welding Specialist program? The interaction with everyone. The class was pretty big; we started with about 20 people and some of the guys were already welders. It was pretty cool because the students who knew how to weld would help us out too. They’d come to school to learn specific processes like MIG or TIG; some people also stayed on for the longer Pipefitting program. But I was brand new to it; out of 20 students I’d say that six or seven of us were completely new to welding. The instructors were pretty good; they did the best they could to help us. The first three sessions we had the same teacher, Mr. Hopkins; he started when we started. He was progressing as a teacher as we progressed as students. He’s a young guy, only 28, and he ended up being a real good teacher. You graduated six weeks ago, are you working yet? I am. I got a job a week or two after I graduated. The company is called Piping Technology and Products. It’s not far from my house and I saw they were hiring welders and fitters. I completed an application, did a weld test and then didn’t hear anything for two weeks or more. Then my mom called me with a message to call this lady at the company. She’d called my mom because she couldn’t reach me. The lady said she’d been trying to call me for two weeks, but her calls never came through on my phone; she left me messages too that I never got. She told me the weld test had come back the very next day and that I’d done real good. So I went in that day, did my orientation and paperwork, then started work the next day. It’s alright; this is a good starting job to get some experience and keep learning. It can be hard getting entry level positions; this company just started hiring entry level people so I’m really just trying to stay focused and learn, and build my confidence. What kind of welding are you doing? The company manufactures pipe supports, hangers, pipe shoes, expansion joints, things like that. I mostly do Fluxcore or MIG welding on different components and brackets. I’m putting a deposit on my house; you know how the first month you’ve got put a down payment and pay the first month’s rent together… so it’s going on that. Many welders like the career because of the travel opportunities; does that appeal to you? I have three daughters, two that are aged six and one aged three; they don’t live with me but I see them all the time, so I don’t like the idea of traveling too much. I’ve always said it would depend on how long and how often. Maybe a week at a time, but that’s it. I don’t want to be gone for too long. Or maybe two or three weeks if the money is real good, but I wouldn’t do it consistently. Where do you hope to be in three years? I want to own my own company and be doing my own welding jobs pretty soon. I don’t have a truck with a machine yet but hopefully that’s where the next couple of paychecks are going – getting a truck and a rig. I’m going to start doing side jobs and take it from there. But if that doesn’t work out, I wouldn’t mind becoming a supervisor or something at a top company. It takes a lot of practice; you’ve got to put a lot of practice to get good at anything, and welding is no different. Even when I was out of school I used to go up there and practice. I can’t lie and say I was there every day practicing, but I did go in sometimes. Now I’m at work I weld all day, every day. And I feel I’m getting better every day. I’m still with a trainer right now, he’s showing me the ropes, teaching me little welding tricks and welding symbols and stuff. Just the small things. What’s your favorite aspect of the welding trade? Honestly I’m in it for the money. Welding is not hard; as long as you practice and put the effort in, it’s not hard. If you practice enough, it becomes routine. It’s something easy to do, but you get paid well for it. But you’ve got to get the training and you’ve got to practice. I made a lot of friends. I’m pretty cool with everybody I graduated with. One of the guys, Zachary, gave me the welding hood I use today. He’s one of the guys I worked most with at school; he was a welder before he came to Tulsa. He came for the pipefitting class, the extra practice and to learn the principles behind welding. After I got the job, I ended up hooking the school up with the company, so I guess they’re going to try to set something up for future graduates; to work hand in hand with them. It’s all pretty cool. Don’t give up. For real. I mean it can be very frustrating when you first start out – very frustrating. So keep practicing and don’t give up. It never crossed my mind to quit because it costs too much to quit. I like to go to the beach. And basically just hang out with my brothers and my family. Invest. I’d invest in property. Houses are always going to sell!